ALVA, Okla. – A year ago, Taylor Munsell sat in Colby, Kan., not sure which way to turn. Her grandmother, Cindy Hunter, was in the hospital and not doing well, and Munsell was set to rope the next morning at the Colby Community College Rodeo. Her family urged her to compete, and the Northwestern Oklahoma State University breakaway roper had hopes of earning a spot in the championship round to fight for the title. She finished 11th in the opening round; only 10 qualify for the short round. She packed up and headed south. Mission accomplished. The Arnett, Okla., cowgirl posted a 2.4-second run to win the first round, then followed it with a 2.5-second run to finish second in the short round. The average championship was dedicated to her grandmother. So is her granddaughter, who finished second in the Central Plains Region standings last season and was part of the Northwestern women’s team to compete at the College National Finals Rodeo. After suffering two no-times in Casper, Wyo., this past June, Munsell went back to work for the third round. But her record was short-lived. The next day, Whitney DeSalvo beat it by one-tenth of a second. Meanwhile, the Munsell continued to pay close attention and take every lesson offered her in Casper. She has nine more rodeos in the Central Plains season to earn her way back to the finale. She wasn’t the only Northwestern cowgirl to find some success in northwest Kansas. Bailee Prom placed in both rounds and was fourth in the average, while Ashlyn Moeder earned points by finishing fifth in the short round and average. For the men, Riley Wakefield placed in both rounds of tie-down roping and finished second overall. 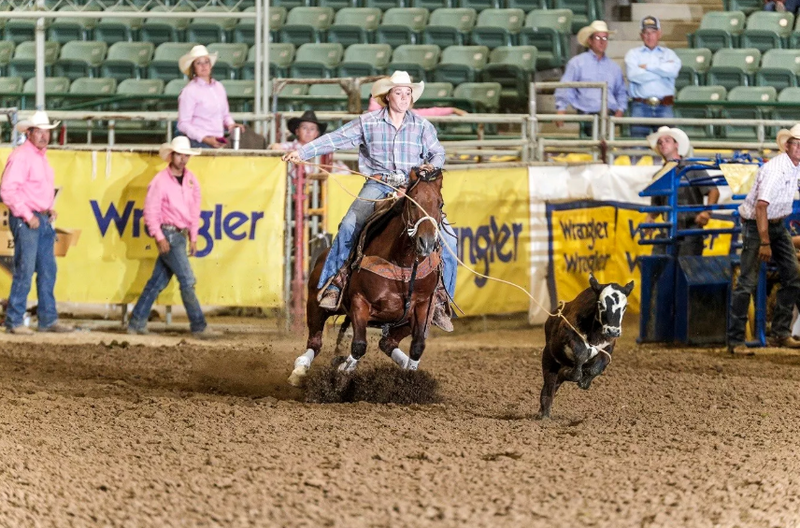 While heeling as a team roper, he finished sixth in the opening round while competing with Denton Halford of Southeastern Oklahoma State University. Tie-down roper Jeremy Carney finished fifth in the opening round. In team roping, Levi Walter and Jayden Johnson finished second in the first round with a 6.8-second run. Although they suffered a no-time in the short round, they still placed fifth in the average. Ethan Price and Bo Youssi placed fourth in the opening round with a 7.3. Steer wrestler Bradley Ralph finished second in the average after placing in both rounds, but he wasn’t alone. Wacey Dorenkamp and Colt Madison also placed in both rounds and the average; Dorenkamp was third, while Madison was fifth.